I have never been a fan of the colder months. The daylight decreases, the water gets cold and the majority of the population walks around with a glum look on their faces. Good news is the colder weather is on its way out here in Australia but before it disappears for good, I decided to cook one of my favourite winter warmers one last time. 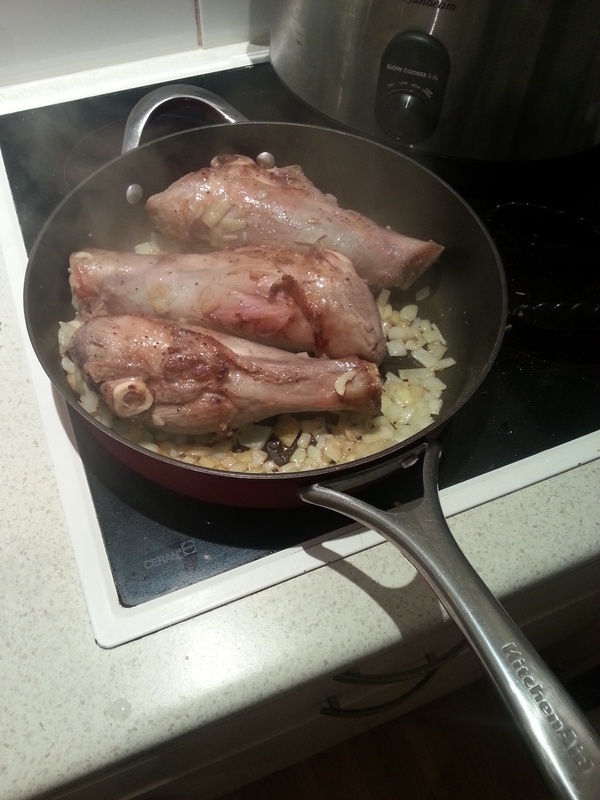 A winter favourite of many the world over, Lamb Shanks. Living in a big city certainly has its downside at times but it also has its positive points too. One of these is the availability of local markets and produce outlets. We get all of our meat from a wholesale butcher that specialise in locally produced meat and sells it at well below the average supermarket price. On my last visit to the butcher, I was lining up to pay for my basket full of protein-filled goodness and I spotted some lamb shanks. Like an impulsive kid in a candy store, I pounced. I usually cook my shanks in my cast-iron casserole pot on the stove top to brown them and then throw the whole pot into the oven for a few hours to let the meat soften and soak up the flavours of the herbs and sauce. This time around, I wanted to try something different so I borrowed a mate’s slow-cooker. The result was amazing. I browned the shanks in a pan with garlic and onion and then added them to the slow-cooker where I had made a tomato and red wine based casserole sauce with peppercorns and rosemary. 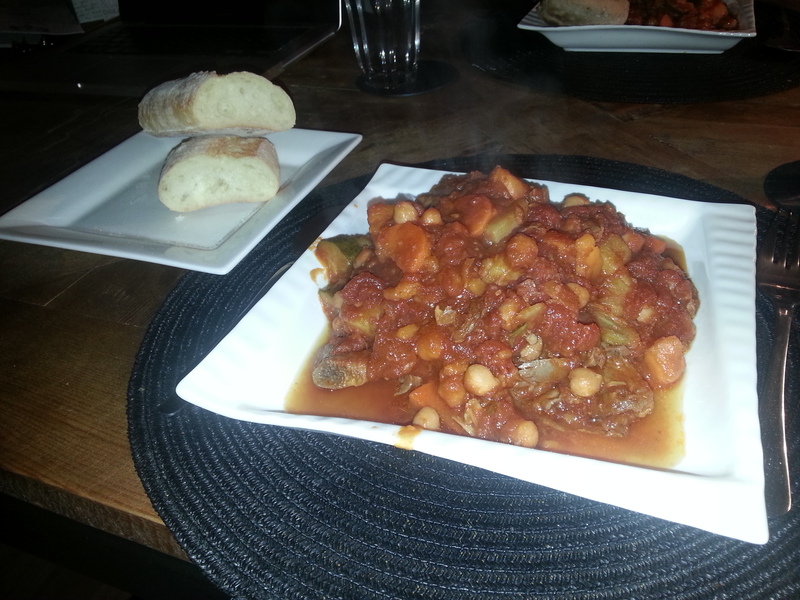 Once in the slow-cooker, I set it to low and left it to cook all day for a total of 10 hours. 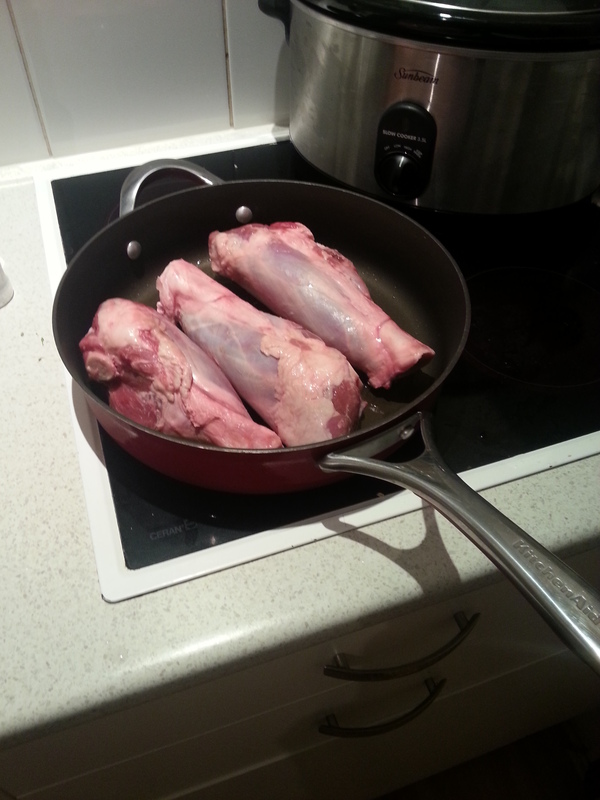 Browning the shanks t seal in the juicy goodness! That afternoon I came home to the scent of shank casserole wafting through my house. While this may sound very unappealing to some but I am a true carnivore and rather enjoyed it. I added potatoes, sweet potato (kumara or yam), carrots and turnips and then seasoned to taste before leaving it to cook another hour until the vegetables were ready. That night we sat down with a glass of red to celebrate what will possibly be our last hearty winter meal until the colder weather returns. By now the smell of garlic and roasting meat was making me hungry. The finished product: It isn’t pretty but it was soooo good!